Speak, and you shall find. Ask, and you shall receive. Let your voice ring out, and at least two times out of three, you will be heard. The first version of Google Mobile App ( ) was strong on searches, but weak when it came to Google’s peripheral applications. Not that Google’s search supremacy was ever in doubt, but with the recent introduction of voice search, the updated Google Mobile App is a quantum leap beyond its predecessor. The secondary Google products are still poorly implemented here, but you will be too absorbed with the voice search too care. How good is the new Google Mobile App? At first, my phone was too overwhelmed to handle the app’s awesomeness. Could Google have my current location? Where is bliss on the map? Crash. 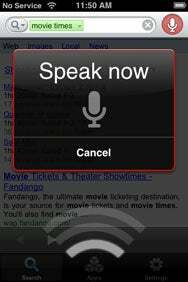 Voice search? Crash. I had to let the phone rest for a few minutes and restart before the app would work. The app takes better advantage of the iPhone’s location function. Recall that with the first version of Google Mobile App, you could type “gas station” or “smog check,” for example, and among the various Web page search results you would see an option for “search… near me.” You would then simply tap the link and Google would instantly launches iPhone’s Maps application. All of the gas stations or smog check centers in your area then appeared as pins on the map. With the new app, if you say “movie times,” the movies playing at the multiplex nearest you pop up in short order. Similar local searches work just as well, but only if you keep the terms simple. When you say “restaurants,” local results will appear below the top search hit for Restaurants.com. But when I said “local restaurants,” the top hit was a link to Google’s own “go local” map feature. I tapped the link, Google Maps launched, and I perused several tantalizing options for lunch… in downtown San Francisco, which is only a short five-to-six-hour drive from where I currently am. Talk Into the Machine: Google has updated its Mobile App to allow you to perform searches with just the sound of your voice. Voice recognition is never perfect, of course. Being a shameless egotist, as well as someone accustomed to having his name routinely mangled, I self-Googled using the voice function. The search returned the following: Ben Boyd Choc, Ben Boyd Chuck, Ben Boy Trucks, and finally me. Google was a bit better when I didn’t egosurf, but still stumbled here and there. I slowly said “Rialto,” and I got back “realtor.” Searching for the letter A—I wanted to hear that funny search voice again—Google returned “Spain.” I find that the second or third try is usually successful. And, in fairness, I have a cold. Of course, you can still search the old-fashioned way—a necessary fallback if the voice recognition software does not recognize your voice. As before, once you start typing, suggestions appear as a vertical list or as common search terms along the bottom of the screen. Pressing the Web site link takes you directly to the Web page via Safari, while tapping the search term brings up Google’s search results page. You can tap a back arrow button to return to your original search page in Google Mobile App. My earlier criticism of Google’s other services still holds true with this update. Google eliminated the “Explore more Google products” button and replaced it with an apps icon in the menu bar at the bottom of the screen. But some key usability issues remain. Gmail is still a cumbersome mess and Google Docs are accessible only as read-only files, for example. The app is still useful for searching and that’s about all. A couple of other caveats: Landscape viewing will not work with voice search enabled because both rely on motion detection. 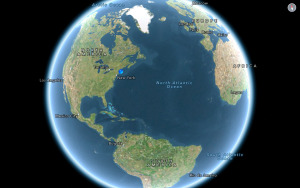 And you need certain related apps, such as Google Earth, to take full advantage of the Google Mobile App. But, let’s face it, most people won’t be using Google Mobile App for the add-ons. “Search” is the word of the day. You can say it loud and proud. Google Mobile App is compatible with any iPhone or iPod touch running the iPhone 2.x software update.